On Labor Day, I stepped outside about 5 PM, to feed the sheep before heading to a concert at a local winery. 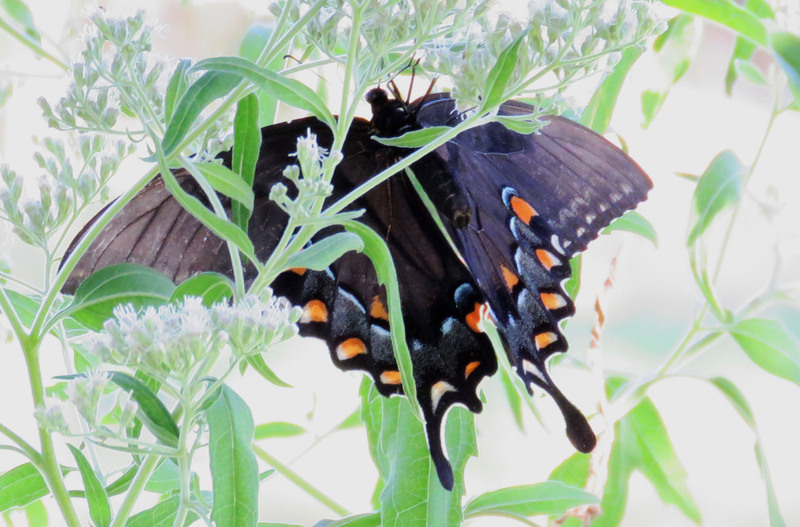 In a late-flowering boneset plant, I noticed a large dark shape that I thought was a bird. It turned out to be a Tiger Swallowtail butterfly. 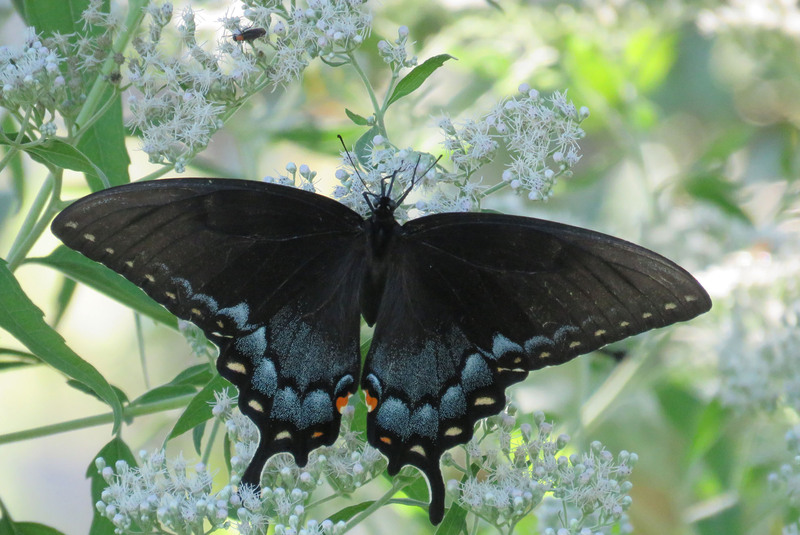 5:01 PM: Tiger Swallowtail (Papilio glaucus) female on late-flowering boneset (Eupatorium serotinum). Dorsal (top) view. Tiger Swallowtail female, ventral (underside) view. 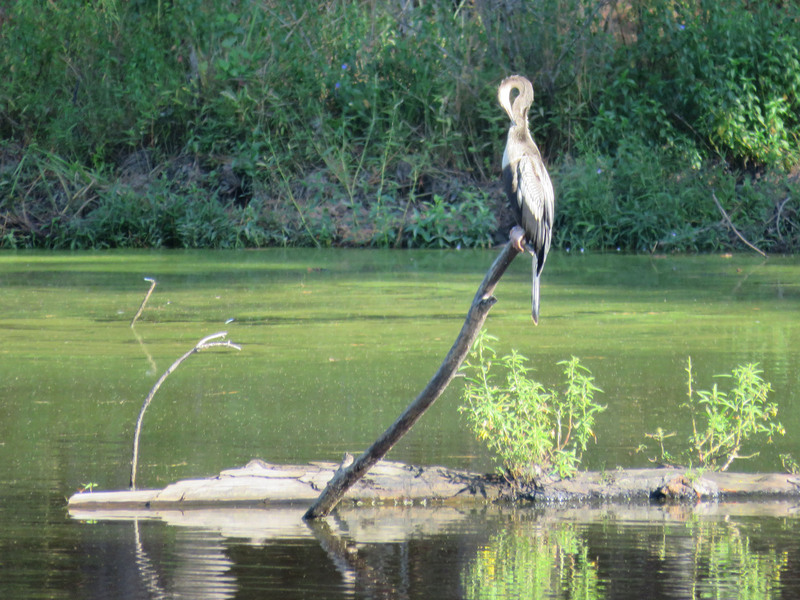 As I was taking pictures of the butterfly, I noticed over its “shoulder,” an unusual bird perched on a fallen tree out in the pond. 5:08 PM: an uncommon visitor. 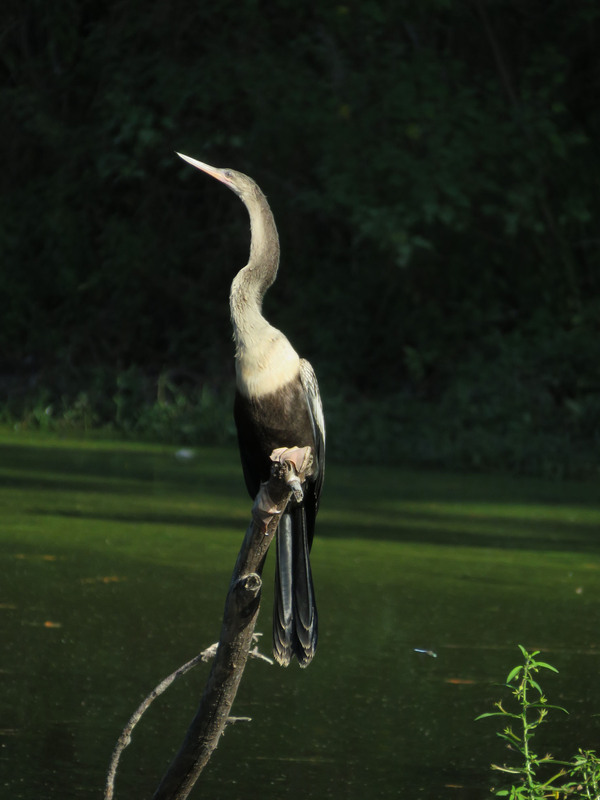 Close-up of Anhinga (Anhinga anhinga). Look at the pale webbed feet that almost look like human hands. 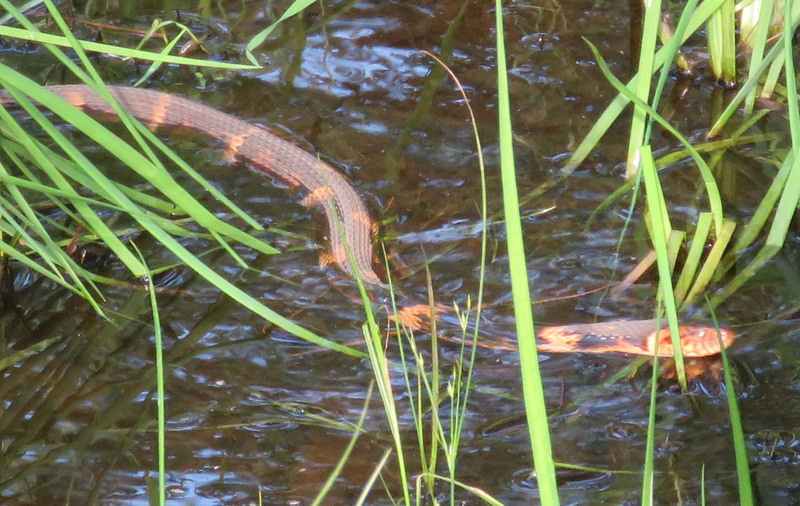 5:16 PM: Broad-banded Water Snake (Nerodia fasciata). The water snake considerately posing for the camera. 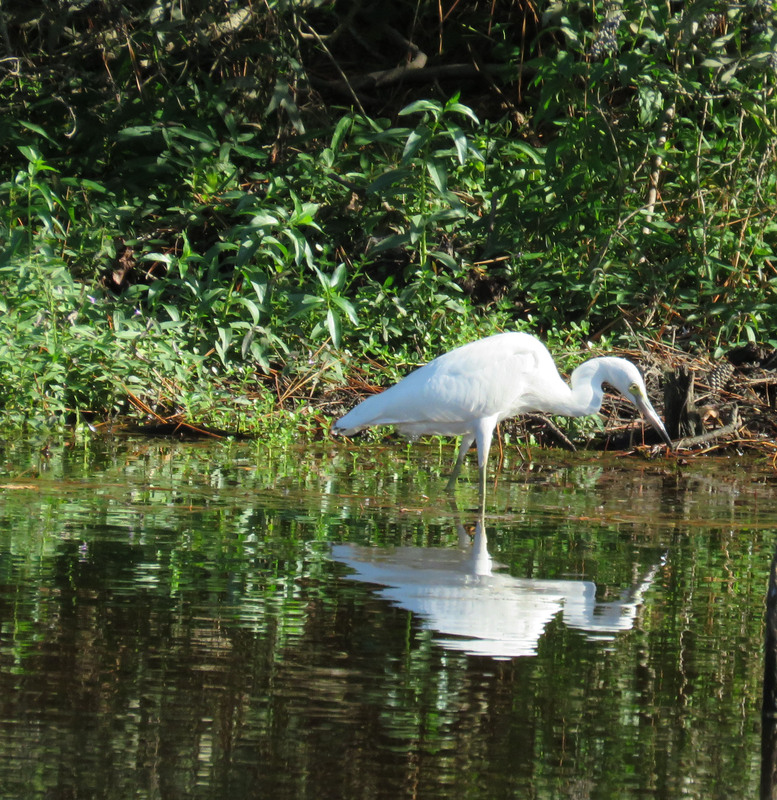 And then I saw this juvenile Little Blue Heron in the background! 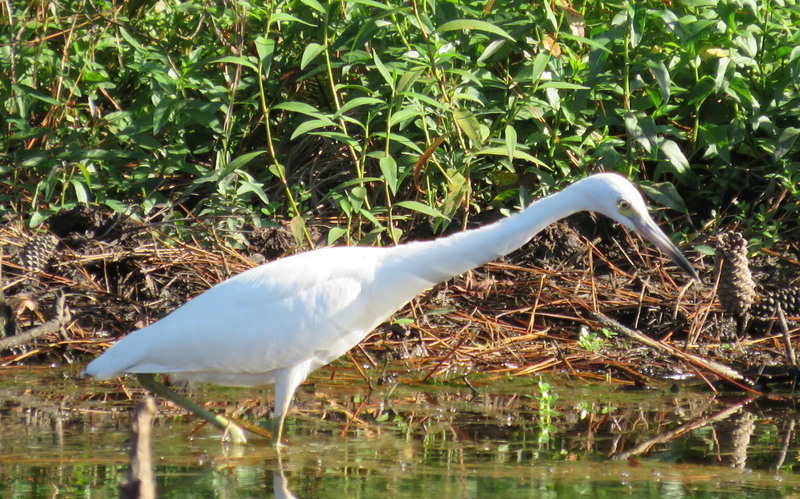 5:16 PM: juvenile Little Blue Heron ( Egretta caerulea). Juvenile Snowy Egrets look a lot like juvenile Little Blue Herons, but I don’t think we’ve ever had a Snowy here, and this bird kept its neck stretched out forward most of the time, so I am going with Little Blue on this one. If you think I have mis-identified it, please let me know! This is why I take my camera with me just about every time I go outdoors — you never know who is going to show up for a photo op! I’m not sure what you mean by “feeding”? I stopped by your blog and I love your pictures! Thank you, I’m glad you enjoyed them. They give my hikes and such a new level of appreciation. Wait, sorry, I understand, it’s because I said it started when I went to feed the sheep! Sorry! My mind had just jumped to the photos and I had forgotten the sheep were in it at all!